This is the place to oder the BroadVision QuickSilver for SDL Trados Studio. License period: 1 Month (30 days). No Subscription! No automatic Renewal! The subscription runs for 30 days starting with delivery of the license file. After the subscription period ends, the license will expire automatically. The license is bound to a specific computer name. License period: 12 months (365 days). No Subscription! No automatic Renewal! The subscription runs for 1 year (365 days) starting with delivery of the license file. After the subscription period ends, the license will expire automatically. The license is bound to a specific computer name. Of course you can buy a new annual license at any time. We will send you a reminder e-Mail one month before your annual license expires. You will save 500 EUR er year compared with buying 12 project licenses. During the license period you are entitled for all service updates and upgrades (including new major releases)! 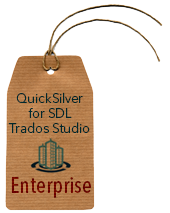 The Enterprise License can be installed for an unlimited amount of SDL Trados Studio Installations within your LAN. The Enterprise License also allows the use in Windows Terminal Server, Citrix and other virtualization solutions. The subscription runs for 1 year (365 days) starting with delivery of the license file. Alternatively, shorter or longer subscription periods may be agreed. The QuickSilver for WorldServer runs as a local installation in WorldServer and creates XLIFF 1.2 files that can be translated in SDL Trados Studio or any other CAT tool. The license runs for 1 year (365 days) starting with delivery of the license file. Alternatively, shorter or longer subscription periods may be agreed. During the license period you are entitled for all service updates and upgrades (including new major releases).